The official facebook page has started posted character spotlights of Skylanders that will appear in the game. I hope she plays better than Super Shot Stealth Elf. The logo change is interesting, I could see that being an emblem to Windham... If we ever got that city as a level instead of a random island. Oh, wow! That's, um... that's a major enhancement right there. I feel like there's a reference to a cartoony shooter somewhere to be made here. Can't work it out for the life of me. I kinda like his non-awakened form best. But his blue gloves look nice! And I like how he looks like he's a bit older. Stealth Elf looks great it her new form. I really like how they kinda made her form a little more proportional. And that red scarf is a nice touch. I think they took Hex's design a little TOO far with this one. Oh wait, I forgot... she is a fantasy witch. She looks pretty cool. I like the rings on her arms and the red LightCore dress. I don't really think having the sides of her dress open is really necessary, it makes her seem a little more mature than the regular Skylanders level. But I do agree with you Roo, she does have a generic fantasy witch vibe. Not sure why. But overall I like her! To be fair, Hex in Ring of Heroes was too much that it made her a bit more of a generic dark sorcerer but who cannot denied those hips. besides, We've seen Stealth Elf's entire belly before this so its no surprise. That is however is a step up on Com2Us part on making a kids friendly series inclusive to most of the RPG games. "Check out Skylanders Traplocke! A new way to play Trap Team." It's in the Trap Team forums. Duh. (06-07-2018, 03:35 AM)DashTwisterstorm Wrote: To be fair, Hex in Ring of Heroes was too much that it made her a bit more of a generic dark sorcerer but who cannot denied those hips. besides, We've seen Stealth Elf's entire belly before this so its no surprise. That is however is a step up on Com2Us part on making a kids friendly series inclusive to most of the RPG games. how i wonder what does spyro look like? I think some characters won't have awakened forms. From what we've seen from teasers, Stormblade & Crusher would fall into that category. Spyro I bet will follow suit. This is strange to me that they used the Supercharger version of Terrafin but I can see some possibility for gimmick skylanders to step in and become awakened. They've used the original Stealth Elf, Jet Vac and Eruptor form and the background that the character was used in front of it was expected to be a dirty brown color. If that was the case, maybe the gimmicklanders will have their own awaken forms. If that was a thing Com2us will also be doing, it makes me wonder what Ninjini's Awaken form woukd looked like. Weird Choice there. Why the SuperCharger counterpart? When you could easly done an awaken form to be more boxer-like, since Terrafin is asociated with fist brawl combat, unless they already have a Skylander in that combat style. Hey, it's Shark Shooter Terrafi- wait, wait, what? You know, I'm starting to think that Activision should probably outsource the series to Asian developers, since these guys from South Korea clearly have a creativity and thinking ceiling above everyone else. Dang Shark Shooter Terrafin looks awesome! I love that orange and black armor. I feel like the thing with Hex is different than SE. SE is a forest ninja, I feel like showing her stomach was never meant to make her seem more attractive but was part of her character. Hex's costume change seems like a deliberate way to make her more hot (like most other fantasy witches *eye roll*). Anyways, I don't really mind it, it just surprised me. He looks like a evil doctor, I love it! The legacy of Spyro must go on. Punching your computer is not the answer. "Yes, it is I. N. BRIO-"
Pop in a coat looks so much better! Pop as a Mad Scientist eh? 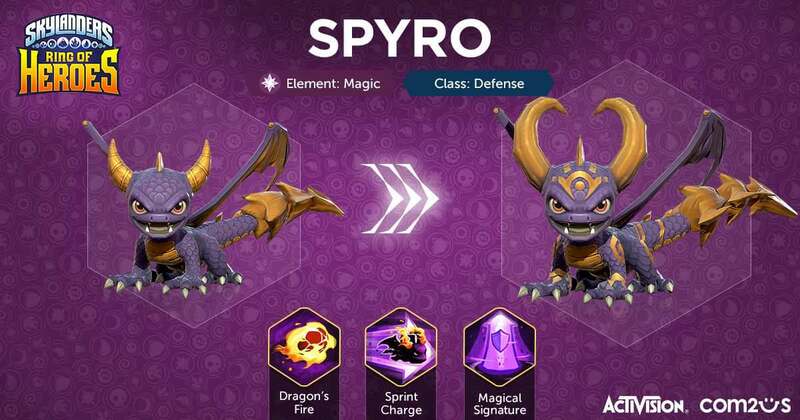 Look at Spyro oh my God. Interesting design, but honestly my least favorite. I like it, but more in a meh kind of way. I kind of thought he'd be an Attack Skylander, not a Defence Skylander.